Australia clinched their third Cricket World Cup with a thumping 125-run victory over India. Captain Ricky Ponting hit a blistering 140 as the Aussies scored a massive 359 for two - their highest-ever one-day total. Despite a fighting 82 from Virender Sehwag, India could only make 234. And in securing their third World Cup triumph, Australia also became the only side to win all of their matches in a World Cup tournament. Captain Sourav Ganguly's decision to bowl first when he won the toss backfired spectacularly. 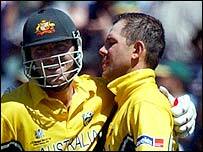 Ponting and Damien Martyn shared a partnership of 234 to take Australia well past the previous highest score in a final - the West Indies' 291 (off 60 overs) in 1975. Martyn's 88, from 84 balls, was completely overshadowed by Ponting, as was the opening stand of 105 between Adam Gilchrist and Matthew Hayden. There was some evidence of the early dampness in the pitch that was behind Ganguly's surprise decision, but his nervous pace attack failed to use it. Eight extras came from Zaheer Khan's first over, and 37 in all. Zaheer, deposited into the second tier of the stand at the Golf Course End by Ponting off the penultimate ball of the innings, finished with none for 67 from seven overs. Gilchrist dominated the early overs, hitting 57 off 48 balls before over-reaching on a slog-sweep at spinner Harbhajan Singh. Harbhajan also dismissed Hayden, caught behind for 37 edging at a ball that came across his body. But he was only brought back into the attack in time to see Ponting complete his half-century in the 39th over. And Ponting then hit the accelerator, smacking consecutive sixes off the spinner on the way to completing his second 50 in just 29 balls. India tried bravely to keep pace with a required run rate of 7.2 per over from the off. But man of the tournament Sachin Tendulkar lasted just four balls before lofting Glenn McGrath a return catch. The innings could have been cut down shortly afterwards had Brett Lee not over-stepped when he had Sehwag, on four at the time, caught at square leg. But Sehwag made the most of his let-off. After Ganguly mistimed Lee to mid-on for 24, Sehwag and Rahul Dravid added 88 for the fourth wicket in 13 overs, either side of a 25-minute break for rain. But the stand was brought to an abrupt halt when Lehmann's sharp throw from mid-off beat Sehwag as he scurried to add to his 82, which included 10 fours and three sixes. Ponting stuck with his top for bowlers for as long as possible and as the pressure grew the wickets came. First was Dravid for 47, playing on to Bichel in an attempt to drive through the off-side. Having been dropped three times, Yuvraj Singh followed for 24, taken at midwicket off Hogg. And Martyn's spectacular diving catch to dismiss Dinesh Mongia effectively finished the contest in the 36th over, the first of two wickets for medium-pacer Andrew Symonds. Australia: Ricky Ponting (captain), Adam Gilchrist, Matthew Hayden, Damien Martyn, Darren Lehmann, Michael Bevan, Andrew Symonds, Andy Bichel, Brad Hogg, Brett Lee, Glenn McGrath. India: Sourav Ganguly (captain), Virender Sehwag, Sachin Tendulkar, Dinesh Mongia, Rahul Dravid, Mohammad Kaif, Yuvraj Singh, Harbhajan Singh, Javagal Srinath, Zaheer Khan, Ashish Nehra. Umpires: David Shepherd, England, and Steve Bucknor, West Indies. "It was an awesome win"
"They played like real champions"
Are Australia the best ever?